run more smoothly and profitably. Do you run into this constantly? Your employees are driving you crazy — tardiness, stealing, lying, vandalism, refusing to follow instructions, goldbricking, breaking agreements, rudeness, vulgarity, cursing, and lots of other dreadful behaviors. Here is how to reduce the turmoil right now! We will explore and explain what went wrong in our society, then give you a very simple three step process to remedy it in your business, so that your firm can run more smoothly and profitably. Ethics Solutions® believes millions have consciously or unconsciously chosen A. We choose B, and we offer a service that will help you instill these fixed, knowable and ancient rules in your employees. It is designed to be completed in as little as three hours, using our three step process. These rules are essential for civilization to function. This means, among other things, they are essential for businesses to be profitable. Equally important is how to think about these rules — how to use them as tools to handle situations we run into each day at work and in the rest of our lives. We at Ethics Solutions do not believe Thoreau was mistaken, but he should have added, within limits. Clearly, the bad behaviors we see in our daily lives are symptoms of a nationwide plague. Ethics Solutions has become convinced that business people are now desperate for a way to teach what is right, and this needs to be secular and neutral, neither promoting nor undermining the doctrine of any church. 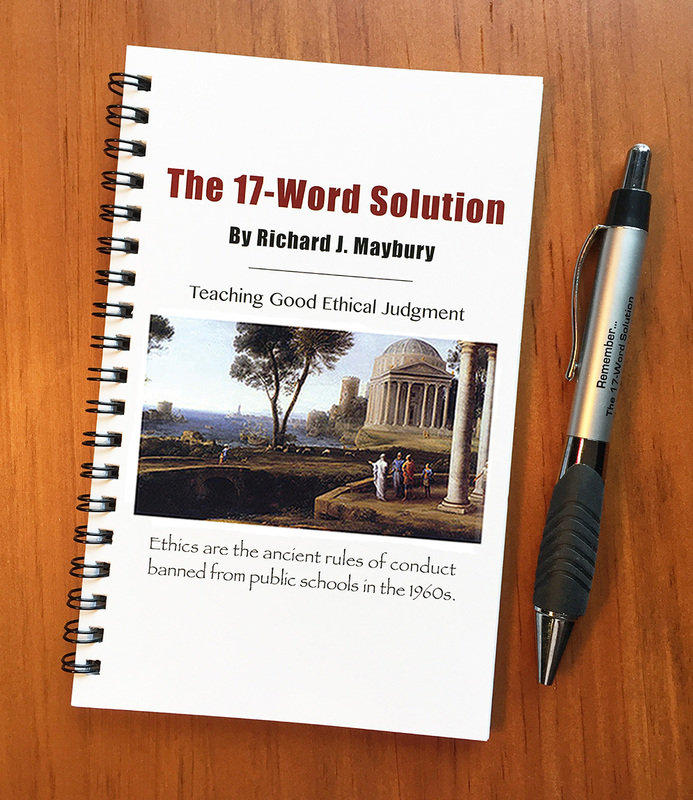 Ethics Solutions has condensed the six years of ethics instruction into a single small, easy-reading booklet called The 17-Word Solution.™ This handbook is the first step toward solving your ethics problems; every employee should read it. It takes only about two hours. The handbook's purpose is to help you stop the chaos. 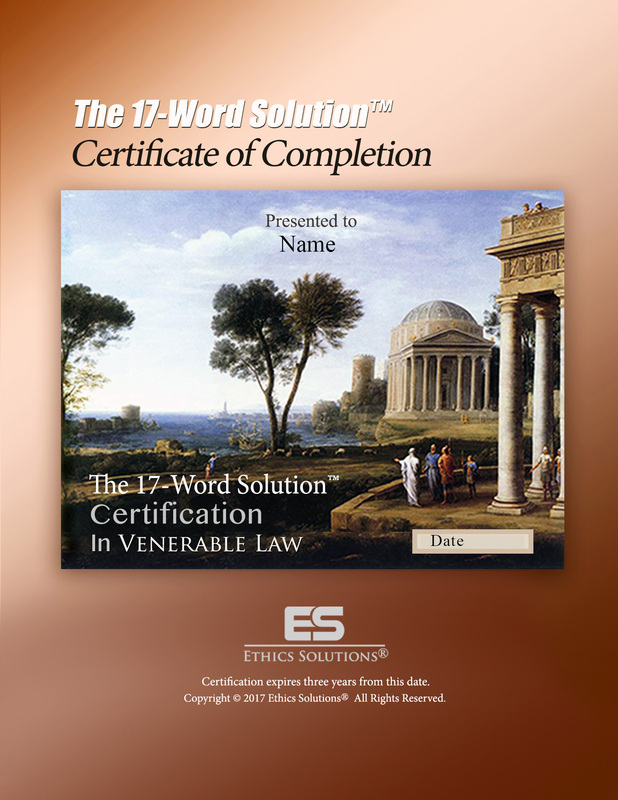 Step two: The Ethics Solutions® Assessment helps you evaluate how well an employee absorbed The 17-Word Solution.™ It usually takes less than 30 minutes and is given online. Please think about this: if you do not teach ethics to your employees, who will? If the need for teaching ethics to employees as a regular part of their training is so obvious, why aren't businesses already doing it? We suspect because they are afraid teaching ethics automatically means teaching religion, and they will get in trouble with government regulators. Another is to show the employee the bad things likely to happen to him or her when a rule is broken, and the good things likely when it is obeyed. The 17-Word Solution™ takes this pragmatic approach. After an employee has read the handbook, . . . It is instantly scored, and the results are reported to the employee and you. If the employee has demonstrated proficiency, a Certificate of Completion is immediately issued to him or her. This handsome, impressive, full-color certificate gives an employee a sense of pride and confidence so that, in the face of troublesome peer pressure, he will stand his ground and do the right thing. If the employee did not achieve proficiency, at your discretion, he or she can review the handbook and take the assessment again. It only takes one unethical employee in a sensitive position to wreck a company. But a company that has a reputation for always behaving ethically is golden.